If my husband had to name a food he couldn’t live without I’d say it would be steak. 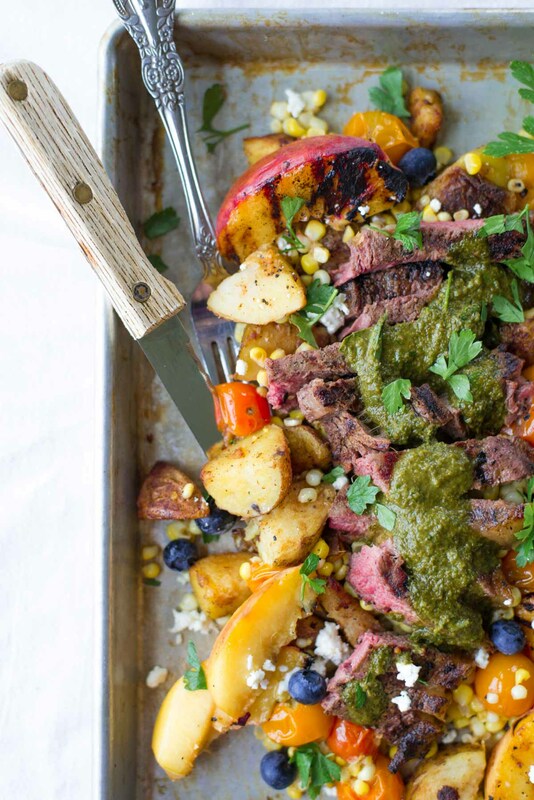 What’s even better is steak with chimichurri. Which is basically short for a perfectly juicy, medium-rare steak coated in a thick chimichurri sauce with just the right amount of kick. Me on the other hand, I could do chimichurri just topped on the abundance of summer produce happening right now. So we’ve put the two together into an unforgettable meal loaded with vegetables, fresh herbs, a good source of protein and a heck of a lot of flavor. I do have to admit one thing, I rarely ever buy steak. So this meal right here is a dream come true for the hubs. And I even let him eat it warm (that poor soul putting up with my photography shenanigans before meals). But lets back up to that chimichurri sauce for a minute. Seriously I have to tell you that if you’re struggling or bored in the kitchen then all you need is a good ol’ sauce. Something that takes the flavor up like ten notches, adds a unique twist and/or just makes food so much more appealing to look at. The sauce is generally the thing that pulls the entire meal together. 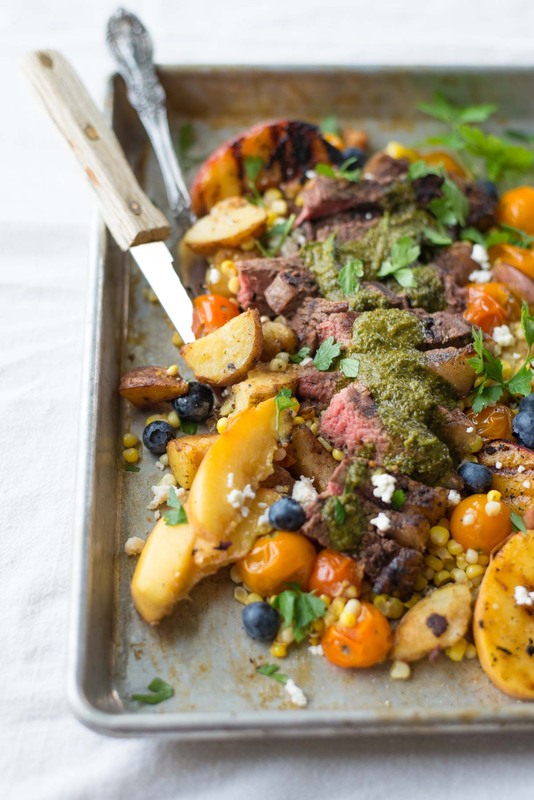 What I like even more about this chimichurri sauce is the use of fresh herbs. Fresh herbs in general are one of the most nutrient dense foods we eat. Which is good news because they’re also the thing that make food taste so darn delicious. They are highly powerful in the human diet and we could even say they are essential. From the range of helping to even blood sugar, enhance memory and mood, decrease inflammation, boost immunity and hold anti-cancer properties, they are definitely something I try to add to every meal possible. 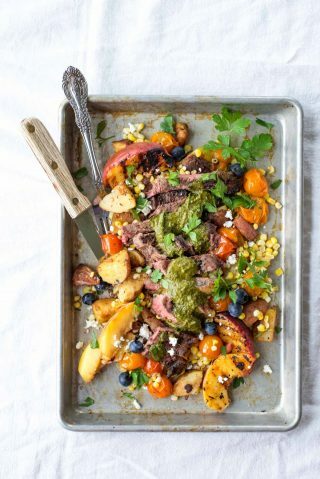 While this chimichurri uses mostly green herbs like cilantro and basil don’t discount the benefits of other spices like cinnamon and nutmeg. I can promise any use of herbs and spices will go a long ways for your health, so load them up. And what better way to start than this perfectly green chimichurri? It’s go a bit of a kick (which you could reduce by reducing the amount of jalapeno pepper) and a slight tanginess from the balsamic that it becomes a perfect complement to many savory dishes. QUICK TIP: I use sauces on my roasted, steamed or sautéed vegetables to make them more appealing. A little goes a long ways in the satiety factor in making me crave more. Which can we just end on this note. If you don’t love healthy food, you’ll probably never keep eating it. So we must learn ways in which we crave it. 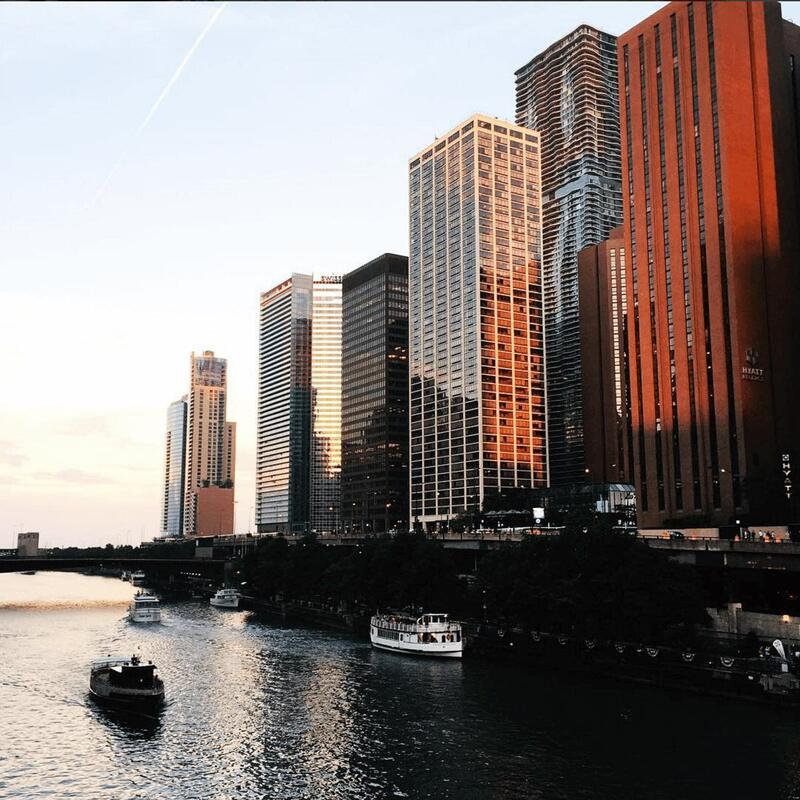 We make it so good that it leaves us wanting more. This is the key to healthy living because I can assure you the only way to make a lifestyle change is if you love it. And given that we eat three plus times a day, we’d better enjoy it, am I right? 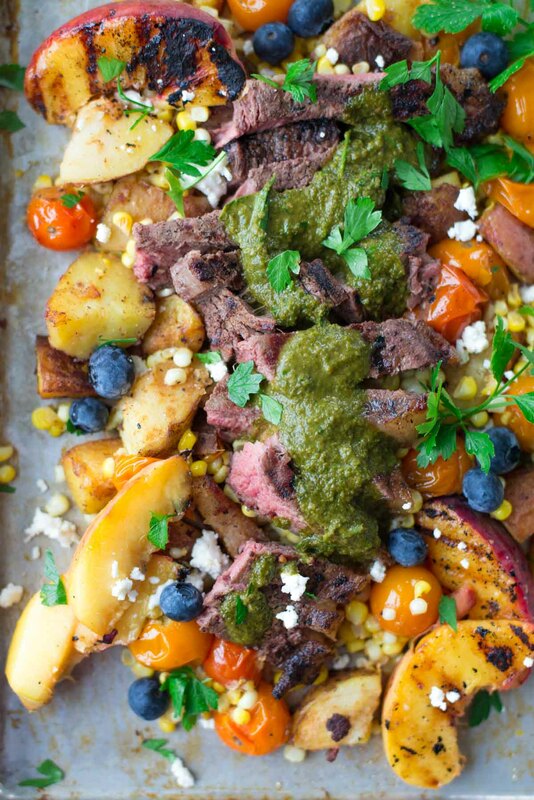 Make chimichurri sauce and set aside. Prepare vegetables by cutting small potatoes into 1 inch sections and pre-cook. Cut corn from the cob. In a large skillet (a cast iron skillet works well) heat over medium heat and add butter. Once hot, add minced garlic and cook until fragrant or about 1 minute. Add in pre-cooked potatoes and saute until browned on all sides. Add in corn kernels and tomatoes. Continue cooking until tomatoes have just burst. Meanwhile, add salt and pepper to steaks and grill. 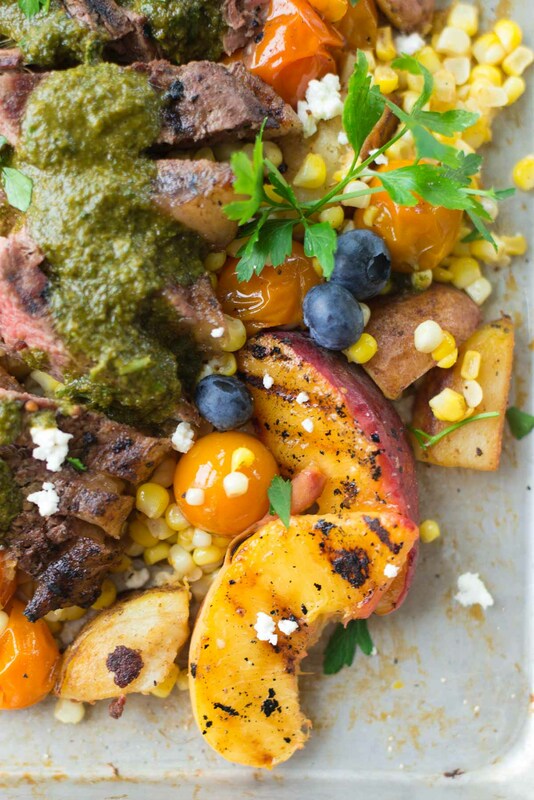 To assemble, place potato, corn and tomato mixture on a plate, topped with sliced steak, sliced grilled peaches and drizzle with chimichurri. Sprinkle with salt, pepper and cheese (optional).